Solms, Germany (September 17, 2012) –Leica Camera presents the first zoom lens for the Leica S medium format system with the Leica Vario-Elmar-S 30-90 mm f/3.5-5.6 ASPH. The range of focal lengths covered is equivalent to that of a 24-72 mm zoom for 35 mm format, providing S-System users access to a lens that possesses the flexibility to cover the majority of photographic needs and simultaneously delivering the outstanding performance of prime lenses. Photographers can now avoid time-consuming lens changes in many areas of photography, from landscape to portrait. The lens provides the opportunity to concentrate more on subjects when time is a critical factor. 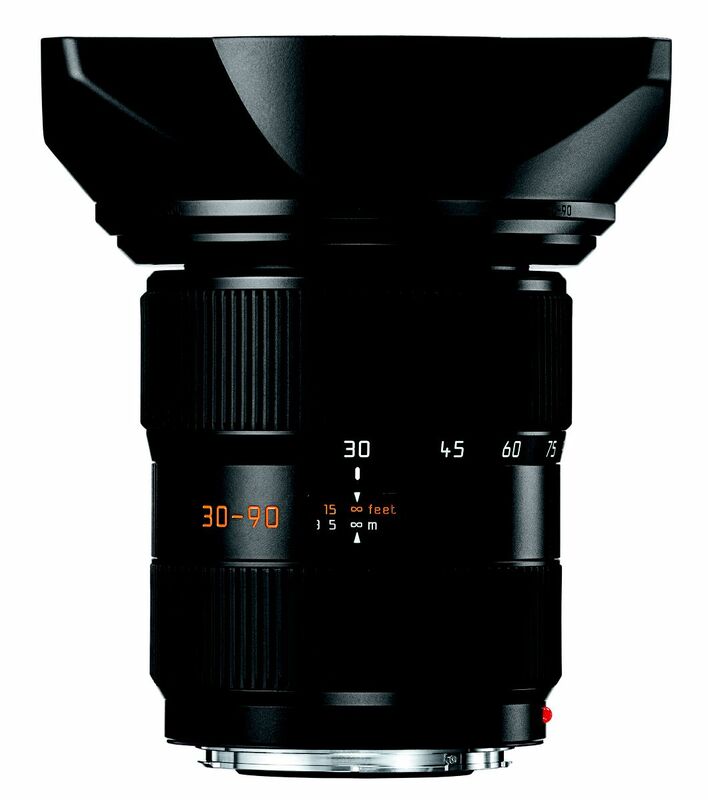 Presenting elaborate mechanical and optical construction, the new Leica Vario-Elmar-S 30-90 mm f/3.5-5.6 ASPH. is also extremely compact and light, with a weight of only 1,345 grams / 3 lbs. (with lens hood). The lens construction is based on 14 lenses assembled in four groups. For a zoom construction, the lens achieves extraordinarily high contrast rendition and maximum resolution wide open thanks to the use of nine lenses manufactured from glasses with anomalous partial dispersion, three of which are fluoride lenses with particularly low dispersion. Two aspherical surfaces on the rearmost lens element and one on the front lens of the second group reduce monochromatic aberrations to a minimum and ensure that imaging performance constantly remains high at close focusing distances. As with the prime lenses of the Leica S-System, the Leica Vario-Elmar-S 30-90 mm f/3.5-5.6 ASPH. is distinguished by rugged, enduring design and construction that guarantees years of dependability, even with frequent use. The lens features an extremely robust bayonet mount and is fully sealed against dust and spray, ensuring maximum dependability even under the harshest shooting conditions. Guaranteeing uncompromising imaging quality for all areas of photography, the current S-System portfolio offers a total of eight lenses (five of which will also be available in CS versions with a central shutter). The lens is supplied complete with a dedicated lens hood specially optimized for its optical system. The Leica Vario-Elmar-S 30-90 mm f/3.5-5.6 ASPH. will be available from selected Leica dealers, including the Leica Store Washington DC, beginning in November 2012. Technical data LEICA VARIO-ELMAR-S 30-90 mm f/3.5-5.6 ASPH. This entry was posted in Leica S. Bookmark the permalink. Trackbacks are closed, but you can post a comment.